This piece is hand carved, 2-D, fully textured and alive with movement. It is vibrant with 100's of layers of glazes and acrylics and finished with several coats of high gloss varnish to allow the viewer to enjoy the piece with their eyes as well as their hands. One of my collectors once said to me "I don't think you see the world like everyone else does. I think you see something that the rest of us miss". That statement embodies my whole goal for creating art. Each painting I create is an invitation for the viewer to step into my world and experience it through my eyes. My inspiration comes from the things that I find to be beautiful and the places I have fallen in love with. Each painting is a reflection of where my soul longs to be. The paintings I create give the viewer a momentary escape from reality, into the world my collector spoke about. I take those perfect moments in nature and put them in motion, so that the entire world can feel the experience. The sheer beauty of the world will never cease to amaze me. 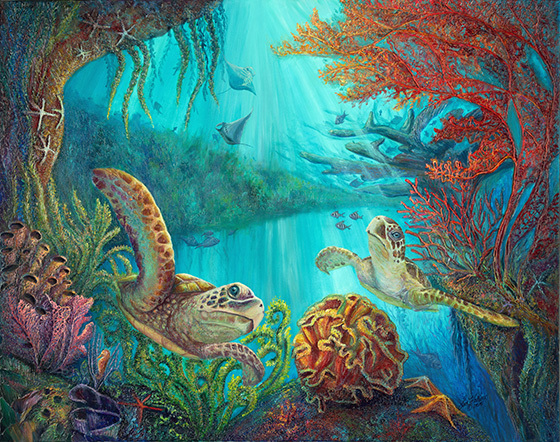 It is my goal to invite the viewer to walk right into my paintings and experience the fight of the fish, the breeze of the ocean, the intense colors of the mountains, as if they are truly in that exact moment.